An enchanting new book about XTC will be published in March by XTC Limelight. What Do You Call That Noise? An XTC Discovery Book was written by Mark Fisher in conjunction with the full support, participation, and commentary from XTC's core: Andy Partridge, Colin Moulding, Terry Chambers, Dave Gregory, and Barry Andrews. The comprehensive book also includes contributions from famous XTC admirers such as Peter Gabriel, Rick Buckler (The Jam), Jason Faulkner (Jellyfish), Chris Difford (Squeeze), Steve Conte (New York Dolls), and more. Fisher also included his extensive review of TC&I's 2018 gig in Swindon, which saw Colin Moulding and Terry Chambers performing together onstage for the first time in 36 years. The 228 page book arrives on March 4th and is available to pre-order now. Heads up: those who order before midnight on Sunday January 27th (UK time, so plan accordingly) will be included in the Venerable League of Neon Shufflers and have their name published in the book. 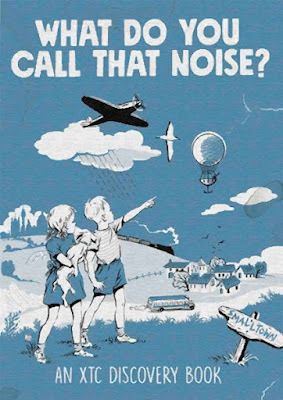 Head here to pre-order What Do You Call That Noise? An XTC Discovery Book and view the trailer below. FYI: Mark Fisher was the editor of 2017's brilliant The XTC Bumper Book Of Fun For Boys and Girls. The 256 page book which features contributions from XTC, reproductions of Limelight fanzines, and much more is available to order here.